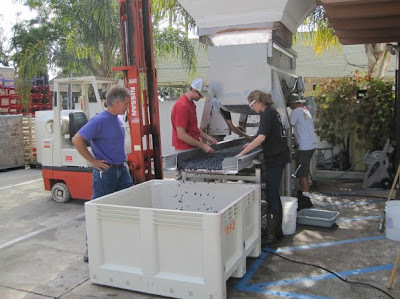 Larner Vineyard Syrah grapes ready to harvest (Phoebe’s ready to work). Back in October, I paid a visit to the other coast, spending a leisurely week in LA. After a few days, despite the incredible respite of my accommodations, the smog, the Uggs, and the botox, started to get to me. So I decided to leave L.A. and venture up to Santa Barbara to visit an old, and very missed friend. Joanie and I got to know each other over countless plates of panini while studying abroad in Rome, and I knew she would be the perfect person to show me the food and drink of the town (emphasis on the latter). As soon as I arrived, she whisked me off to Santa Barbara Winery, where she is the director of marketing and national sales (basically, a pretty big deal). As we walked around the stainless steel vats, she taught me most of what I know today about the wine process, and let me taste the Chardonnay in its various stages. She pointed out how the young wine was sweet and aerated and how the finished bottle had developed bright, balanced, and fruity notes. When we finished, it was only 11am. 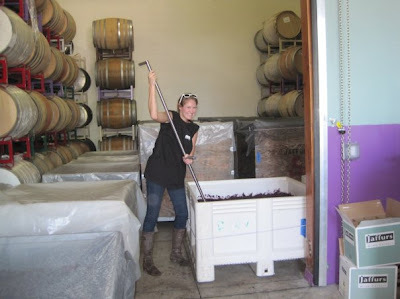 Now that I had been briefly educated and integrated into SB culture (wine for breakfast), Joanie took me to get my hands dirty at Jaffurs Wine Cellars, where we were going to harvest syrah grapes from Larner Vineyard for their 2009 vintage. I was excited to get started. But before we did, the plastic table from the tasting room was carried outside, and we sat down with the Jaffurs family to eat turkey club sandwiches and wash them down with more bottles of wine. By the time my assembly line duties called, I was ready to curl up on top of the mounds of grapes and take a mid-afternoon Dionysian nap. Instead, Joanie handed me a beer (beer?) and told me to take my place on the conveyor belt to begin sorting. Maybe I was a factory worker in another life, but I really loved this task. It was like a computer game—picking through healthy grapes as they came pouring down the shoot, throwing twigs, leaves, and bugs to the wayside. When I explained my joy to Matt, he told me this was nothing. Apparently, I might not have dug the sorting process so much on a day that featured a more harrowing batch of grapes, one containing branches, snakes, and way bigger bugs. It was an incredibly satisfying day of manual labor, among even more satisfying company. Everyone I met infected me with their passion for wine, teaching me the different nuances of its creation and making me enjoy glasses of it from 10am til dinnertime. Joanie and I were lucky to each receive a bottle of the 2007 vintage in return for our services, and we cracked hers open at dinner (after a pit stop at another tasting). I certainly don’t pretend to be any sort of authority on pairings, or wine in general. So I trusted Joanie’s judgment when it came to the menu at Le Petit Valentine, where we ate. She ordered us creamy mushroom bruschetta to start, then a juicy beef fillet on top of rich mashed potatoes to follow. I didn’t want to stray far from her original pairing when it finally came time for me to enjoy my bottle of Jaffurs Syrah back East in the comfort of my own kitchen. I did still change around a few components, letting the mushrooms become a bed for my flank steak and adding a little Syrah to the marinade and the sauce. The end result was delicious alongside the wine, but more importantly, the meal was nearly as romantic as the original dinner with my dear friend Joanie, who later tucked me under the covers in her bed, as there was no way I was driving back to LA until morning. Speaking of romance, men seem to like steak sort of a lot. And the one in my life seemed to enjoy this particular steak dinner–albeit on a night less assuming than Valentine’s Day–quite a bit. Should you be part of a perfect human pairing, you might make this perfect dinner tomorrow for your better half. A home cooked meal is surely a more original gift than a dozen roses, and definitely less awkward than a chocolate bas-relief of your lover’s face. Enjoy it with a bottle of full-bodied Syrah, though you might want to leave it to your local wine shop to help you find the perfect pairing. Combine all the ingredients for the marinade in a large Ziploc bag and shake around so they are well mixed. Add the steak and fully cover and submerge in the marinade. Lay flat and refrigerate for at least 2 hours, up to 1 day. Preheat the broiler, and place the oven rack as close to the heat as possible. In large skillet, sauté the shallots in a tablespoon of olive oil over medium heat until translucent, about 4 minutes. Add the mushrooms and continue to sauté until tender, about 10 minutes. Add the garlic and continue to cook for another 2 minutes. Remove the steak from the marinade (reserve this for later) and pat it dry with paper towels. Season well with salt on both sides. Place the steak on a sheet pan or in an oven-proof skillet, and broil in the oven, 4 minutes on each side for medium-rare. Remove to a cutting board and top with a pat of the chive-parsley butter. Cover the steak with foil (tent it over the top) and allow to rest for at least 10 minutes. In the meantime, add the wine, reserved marinade, and butter to the mushroom mixture and continue to cook over medium heat. Taste for seasoning. When ready to serve, stir in the chopped parsley. When rested, slice the steak against the grain. Arrange the slices over a spoonful of mushrooms, and slather a piece of toasted country white bread with the remaining chive-parsley butter. Serve with a class of full-bodied Syrah. In a small bowl, cream the butter along with the herbs. Add a pinch of salt, and taste for seasoning. For a firmer texture, refrigerate. I just opened the "invitations" section of facebook for the first time in 2010 and got very excited about your heart shaped pan giveaway. Now I am "commenting" on your "blog." Firstly, I was at a friends birthday party last night and I met a real life FAN of your blog and got so excited I spent about 15 minutes talking about how I've gotten to hang with both of you through David. You're moving towards celebrity status, I swear. A gigantic breakfast. Poached eggs and sauteed spinach, english muffins, cornmeal banana pancakes and a side of canadian bacon. We're cooking dinner tomorrow, and I've eating enough brunch food in the last week to feed a small army so I think my dream valentines day meal is hypothetical. Anyhow, happy blogging and happy valentines day! YUM!! i'll definitely be trying this one out — thanks for sharing!! Yum! Finally a recipe that serves 2. I always have the worst timing cooking for just 2 people. this looks delicious, can't wait to try! oh those chipollini onions are brilliant…Great post and photo. Can't wait to try them. This recipe sounds amazing!! I'm so jealous of your trip that sounded like a blast. I can't wait to make this for my boyfriend he will love love love it brownie points for me thanks to you!! Thank you so much!! Came across an amazing i phone/pod app. It's an easy to follow video tutorial on how to make flat breads. The breads look amazing, and after l finished making them l was very impressed!! Can hardly wait for her next video to come out. Here is the link for the app. http://dailyappshow.com/cooking-with-eat-drink-talk-lighter-than-air-flatbreads and check out her website Eat Drink Talk, for free over the top recipes!